”On average our campaign had a conversion rate around 4.2% - where web display ads (expectedly) had the worst performance at 0.5%. 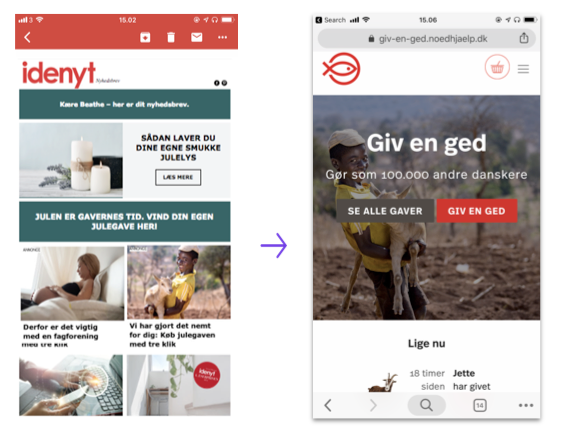 I see Passendo as a top-funnel campaign, so with a conversion rate at 4.68%, I’m really satisfied with the results.” said Kasper Bergholt, Digital Marketing Manager at Folkekirkens Nødhjælp (DanChurchAid). ”Passendo not only met our goals for branding, but also achieved a solid amount of conversions throughout the campaign period. We will definitely use Passendo again for our next campaigns”. COMPANY: Folkekirkens Nødhjælp (DanChurchAid) has a vision of a world without hunger, poverty and oppression, in which popular and political powers constantly work strongly and actively for a just and sustainable distribution and use of the earth’s resources. CHALLENGE: The challenge for Folkekirkens Nødhjælp was to make people change their minds regarding Christmas presents to give goats, solar lamps, bicycles, and trees instead of the usual material gifts in a highly competitive marketing landscape. SOLUTION: Use the Passendo platform to successfully attract potential customers across multiple premium editorial newsletters where optimisation against conversions was prioritised.